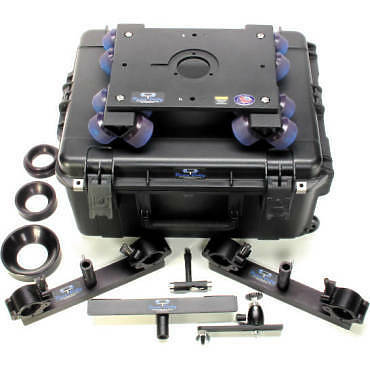 The Dana Dolly Portable Dolly System Rental Kit with universal track ends is a heavy duty camera dolly platform that rides on 16 custom modified soft polyurethane wheels that resist flat spotting and use ABEC-7 rated precision bearings providing you with extremely smooth dolly shots. This kit is complete with 75, 100, and 150mm bowl adapters, and comes in a custom flight case. The dolly platform is machined from aluminum and features a standard Mitchell mount including a 2.75" center hole with a machined keyway. 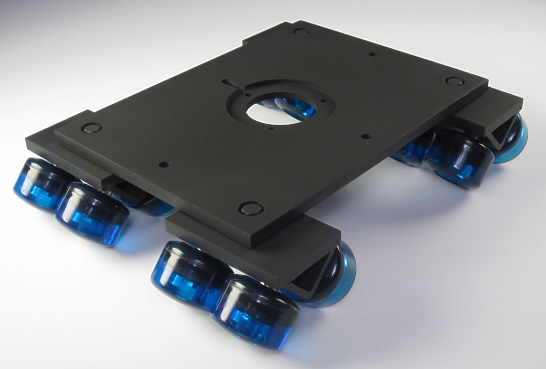 The platform incorporates one 3/8" through hole, one 1/4"-20 threaded hole, and one 3/8"-16 threaded hole on each side of the dolly platform for a total of 6 accessory mounting holes. The rental kit includes a monitor mount with a ball head adapter. The Dana Dolly is designed and manufactured in the USA. The key to the Dana dolly's smooth ride is the 16 custom machined track wheels. The wheel trucks can swivel on the dolly, which allows it to ride on the straight and round track. The Mitchell mount features an elongated keyway, allowing you to use non-standard adapters.